So you have a projection project and a deadline AND a budget? Didn’t pay as much attention in the video class? Fear not! A solution is here….Video Signals for Dummies – from On Stage Lighting. There are a great number of factors when trying to spec and pull off a successful video presentation, but like all things in our business, break it down in to it’s component parts and it will be manageable (pun intended for the vidiots). In this guest post by projection professional Jeff Gooch over at ProjectionFreak.com, we start to get our heads around things us lampies may have managed to avoid so far – media and video. Lighting and projection were often the domain of the lighting designer, especially in theatre and the work of pioneers such as Richard Pilbrow. While video projection has become a specialist job with dedicated technicians, the convergence of digital media and lighting has brought new skill requirements for those of us who used to spend most of our day “focussing” PARcans with an extended stage brace (don’t worry, I still do that too!). The first hurdle to get over when dealing with vision is simply the different signals and connectors used. Help us out here, Jeff….. IMAGE Acquisition: your graphics, camera feeds, and any other sources- decks, etc. PROCESSING: switchers, scalers, scan converters, etc. OUTPUT: displays, projectors, record decks, screens. All the different pieces of gear in the bookend categories are all going to have different resolutions and different capabilities. PROCESSING is where we want to equalize everything to hopefully make the output to the display the highest possible quality. Composite is a signal that travels down a single conductor (shielded) cable. It is all the video information “composited” to one signal, that is, color, sync, and brightness. 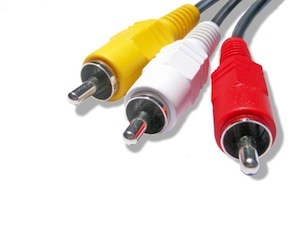 It’s usually the single, yellow RCA (Phono) connector on the back of the TV or projector. 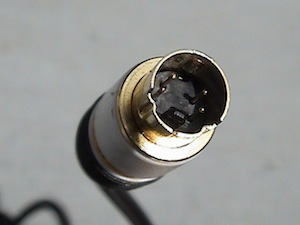 This type of connection, while still in circulation, is rapidly disappearing as it has no support for HD, unplugs easily, and has no audio path (although it is commonly used as an unbalanced audio connector). 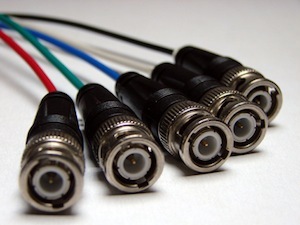 Composite is usually carried down single BNC connectors as well. Y/C- or “S” is the video signal divided into two separate paths, Y (or Luminance/white level) and C (Chrominance/color). It’s a generally flimsy connection that is rapidly disappearing as a standard on TV’s, projectors, and cameras. Y/C cable is usually 2 conductor, shielded, with 4 pins on a Mini-DIN connection, and limited in length. Y/C cable has no support for HD or audio. It’s carried on 3, 4, or 5 conductor cable, shielded and can be terminated in RCA or BNC. Many projector manufacturers will use a DSUB15-to-BNC breakout to accomplish this. HDMI is High Definition Multimedia Interface. Different versions offer different levels of support for Audio and Video Signals, but all versions are capable of ATSC video standard resolutions, 8-channel, 192kHz, uncompressed digital audio and the DVD related compressed formats (Dolby Digital and DTS). HDMI is used on Cable TV, FIOS and Satellite STB’s (Set Top Boxes) , Receivers, Display devices such as HDTV’s, LCD’s, Projectors, Plasmas, DVD players, Blu Ray Players, HD DVD players, gaming consoles, and most newer cameras. The connector has no locking mechanism so it is easily pulled out by accident, and HDCP copy protection does not allow conversion to analog for compatibility with older HDTV’s and other displays. You’re also very limited by cable length. SD-SDI and HD-SDI are acronyms for Standard Definition (or High Definition) Serial Digital Interface and represent the holy grail family of signals. These signals are outlaid in SMPTE 292M with a nominal data rate of 1.4 Gbit/s for single link. It’s faster cousin, Dual Link (outlaid in SMPTE 372M) has a nominal data transfer rate of 2.9 Gbit/s. There’s a single link version of this out called 3G (as if we haven’t heard enough of that acronym…). 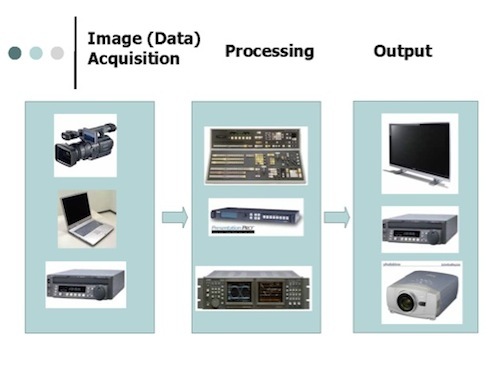 These types of signal are used for the transmission of uncompressed, unencrypted digital video. It’s extreme speed is unfortunately limited to distances of 300m or less (without signal re-clocking). They’re usually carried down Single conductor RG-6 cable or better and terminated with a BNC connector. In all cases, quality is paramount. Does this mean you have to go broke buying ridiculously priced cable? No. As in all things, shop around, ask questions, read the data sheets of reputable manufacturers. You’ll learn everything you need to know. Thanks, Jeff!! Don’t forget to head over to ProjectionFreak.com and check it out. Following a cheeky request from me, Jeff has also created a really straightforward video tutorial on the basics of setting up a projector. Here it is. Hi Rob, just as an extra little question, how does DVI fit it? 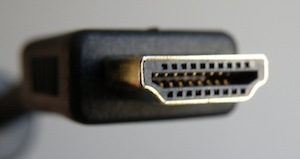 With many PCs ad Macs now supporting DVI or mini DVI natively, can this just be treated as another XGA or UXGA signal on a different style of connector, or is this different again? DVI would fit in right around HDMI, in fact, they are quite compatible…the difference being no audio on DVI. The DVI interface (whether mini-in the case of a newer Mac- or sub) has actually 6 variants, DVI-I (single and dual link) -D (single and dual link) -A and M1-DA (dual link +USB). Just remember 3 things, DVI-A (analog only), DVI-D (digital only) and DVI-I (integrated). To add to the confusion, HDCP is implemented on many devices, so simply using an adapter might not pass signal! Always check the standard for the OUT or IN on the devices you want to connect, then match it with cable/adapter, and you’ll be good to go! XGA will be fine as will UXGA, higher rezzes with different cable lengths may need a boost. 1) You’ve always got the wrong DVI adaptor (wrong design of pins, crosses etc). 2) And all you really want to do is jump the RGB element back to a connector that fits with your system. Having said that, I have had success using DVI outs on Mac to output some half decent resolutions from a Matrox Dual or Triple Head To Go. Good quality DVI cable, as short as possible seems to be the order of the day. Great articles you have on the video projection. We use Video and VGA cable a lot when wired to the fixed projection system. HDMI cabling is getting popular lately. Have to be carefull not to path alongside with stage lighting cabling or you might get unwanted noise.